West Yellowstone, Montana is the number one gateway to Yellowstone National Park. 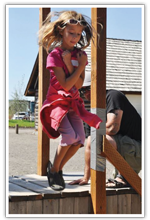 Right before the entrance to the park sits four historical buildings, housing the Yellowstone Nature Connection (YNC), a nonprofit organization which connects children to nature through the mechanism of smokejumping. The founders of the organization realized that while there is natural beauty all around us, children visiting Yellowstone National Park were seeing it in a car, and not experiencing it with their hands and minds. As retired smokejumpers with children and grandchildren, they worked with educators to develop a program where children would put down their electronics and play outdoors. They have since hired an educator and two interpretive rangers who specialize in children’s outdoor education. The program explains fire behavior, fire ecology, and different types of forests in the Yellowstone area with matchstick forests, audience participation, storytelling, puppets, and specimens. The children use the knowledge to conduct experiments. But the time is not complete lecture; rather, there is physical exercise as well. 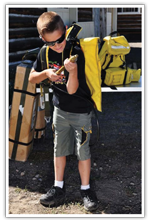 Using smokejumper tools to make a fire line, exercising on the lawn and the pull up bars to beat the high records of other children, and jumping out of a mock fuselage airplane are all part of the program. and children experience for a moment what it is like to be a smokejumper. As a relatively new nonprofit, Yellowstone Nature Connection has some lofty goals. This year they plan on reaching out to over 3,000 children. They may fulfill that goal by keeping the price of the program low, encouraging school groups, scouts, and day camp attendees to the program, and cross marketing with companies like Coach-Net and Disney. 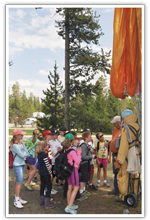 They also work with federal entities such as the Forest Service, Bureau of Land Management, and National Park Service and plus the Town of Yellowstone to inspire children to attend. Their goals do not end there. They have reached out to the community to provide other programming, such as preschool nature readings of books sold at the center, astronomy programs, birding programs, early evening smokejumper programs, and activity centers to play and learn. Each year, over 3.5 million people drive by Yellowstone Nature Connection’s campus on the way to the park. What better way to enjoy a couple of hours outside of the car or RV than to come by the center, enjoy the sunshine, and learn something new? There are over 25 RV spots in our shared parking lot with the West Yellowstone Visitor Center for a short visit and a sixty spot campground right next to the center for longer stays.